Adobe unveiled a tasty bundle of updates to its Creative Cloud video applications at IBC 2017. The Amsterdam-based show doesn’t garner the same slew of new product intros that NAB does. But many companies big and small save their latest-and-greatest announcements for this Fall show for that very reason of a lowered PR frenzy. Adobe didn’t disappoint that hankering for something new. The San Jose-based company’s ubiquitous video apps got a considerable tweaking. Something new and significant came throughout their range of video-specific software, including Premiere Pro, After Effects, Audition, Character Animator as well as Adobe Stock. Adobe’s latest innovations include advancements in 360/VR video, animation, motion graphics, editing, collaboration, audio and productivity. As Adobe puts it, video is the fastest growing medium in communications and entertainment and they’re right. Video, once a novelty on the internet has become not only common, but a key way that information, entertainment and advertising is distributed and consumed by millions (maybe even billions) of people each day. It is an exciting time to be involved in video and Adobe is on the leading edge of this revolution. 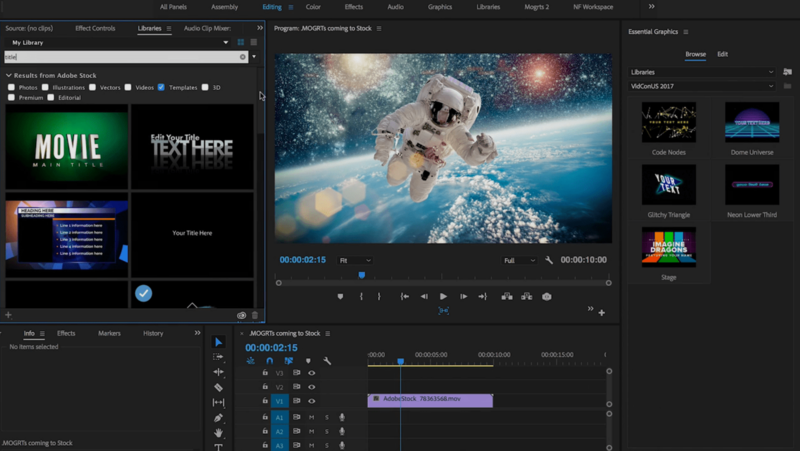 The past few years has seen Premiere Pro emerge from being an also-ran to its position today as one of the leading editing platforms in the world. Many professional editors are using Premiere Pro these days, not just because it’s conveniently part of the Creative Cloud, but because it simply works great (not to mention that it is super fast and format friendly). Recent noteworthy productions that have been cut on Premiere Pro include An Inconvenient Sequel: Truth to Power, Mindhunter, Only the Brave and 6 Below. Motion Graphics Templates to be available through Adobe Stock. Motion graphics templates created in Adobe After Effects allow you to easily access great looking and professionally designed graphics for titles, lower thirds, bumpers and closing credits. In this release, editors who use Premiere Pro will now be able to access hundreds of motion graphics templates via Adobe Stock and through Creative Cloud libraries. Also, if you are a motion graphics artist, you will be able to sell your own generated templates for Premiere Pro through Adobe Stock. Adobe stock, in case you didn’t know, is a comprehensive creative marketplace from Adobe that already has over 90 million assets such as photos, illustrations and vectors. It also offers access to over 4 million HD and 4K footage with the ability to search and scrub assets in Premiere Pro. Not too long ago Adobe added assets from Reuters, USA TODAY Sports, Stocksy, 500px as well as Pond 5 collections to Adobe Stock. In addition, Adobe has updated the Essential Graphics panel in Premiere Pro with things like responsive design options which make it easier when working in multiple formats and ratios. As I previously reported here, Adobe recently acquired Mettle’s SkyBox 360/VR technology. As expected, the fruits of this acquisition are starting to appear, one of which is a virtual reality viewing environment in Premiere Pro. This means that editors will be able to experience VR while editing by wearing the same VR head-mounts as their audience as they continue to use their keyboard and mouse to navigate the timeline while creating transitions, titles and graphics in immersive 360 video. Also, VR effects and transitions are now natively accelerated by the Mercury playback engine. 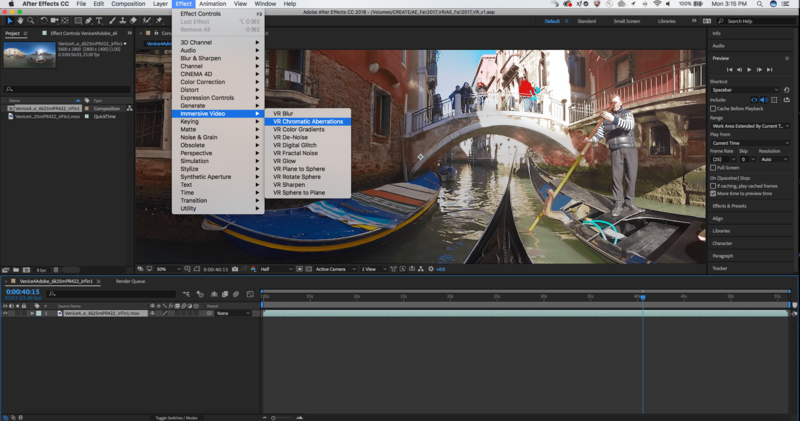 Both Premiere Pro and After Effects feature new tools for Immersive Video. In addition, you will be able to add and modify audio in the VR environment by its orientation or position and export that audio as ambisonics audio for VR-enabled platforms such as YouTube and Facebook. 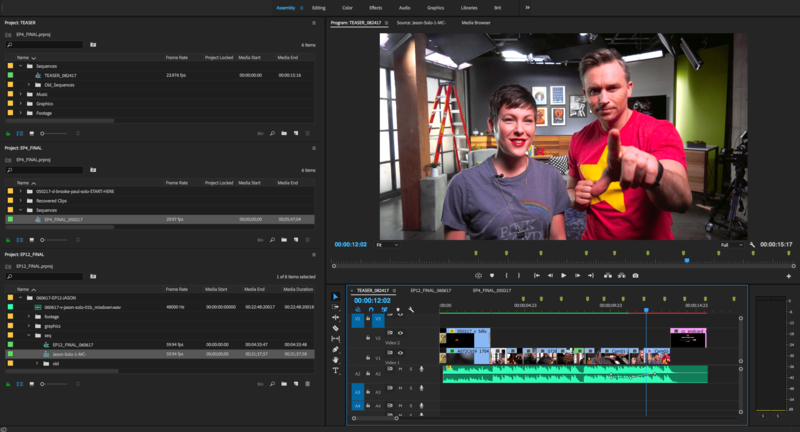 Adobe Premiere Pro now features improved collaborative workflows that let multiple users edit shared projects at the same time while allowing read-only access to others. This will allow teams working on shared projects hosted in the Creative Cloud to manage their shared projects more easily. Open multiple Premiere Pro projects at the same time and edit between them. However, one of the greatest new features in Premiere Pro the ability to open multiple projects, edit between them simultaneously and easily copy sequences and media between them by simply dragging and dropping from one project to another. That’s sure to be a really useful feature and a real time saver. Not to be outdone, Adobe After Effects also boasts its own list of new features and enhancements. There are new data-driven tools that let you automate the animation of graphics through expression-driven, customizable user-interface elements. That means you can build your own collection of expression controls like sliders and dials to control the various parameters of the desired effect and be able to easily keyframe them as you like. 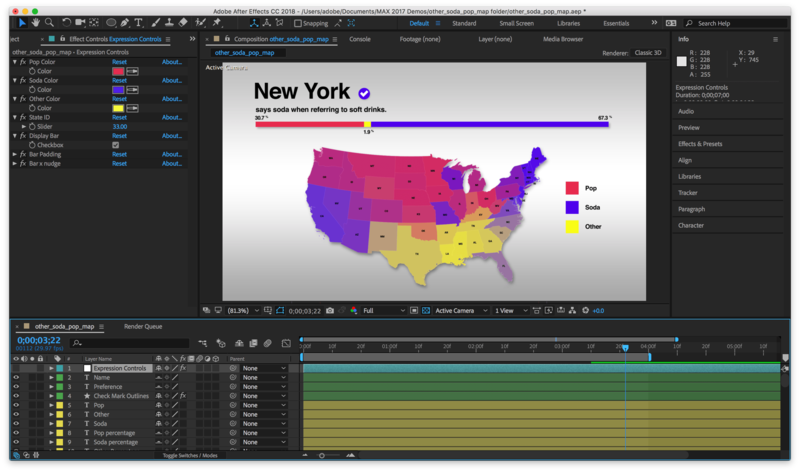 Control complex animations with data driven expression controls more easily in After Effects. However, another important update to After Effects, possibly my favorite and something that I have personally wanted for a long time, is the ability to control individual mask and shape points with expressions. The ability to gain access to individual vertices on a path or a shape via expressions will open up lots of creative possibilities not only for motion graphics but also for character animation and rotoscoping work. This is a feature that I, for one, am eager to try out. Like Premiere Pro, After Effects will also see new tools for working with 360/VR video. 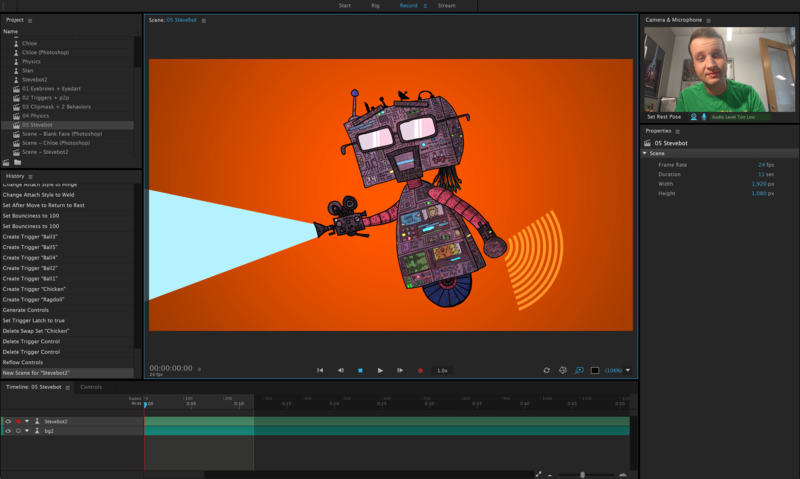 Adobe Character Animator, The Creative Cloud application that is designed to simplify the creation and animation of 2D characters has gotten some love in this release as well, with changes to its core and custom animation functions. This includes pose-to-pose blending, physics, and new puppet controls. In addition, Adobe Sensei, a kind of artificial intelligence/machine learning framework, helps with lip syncing by automatically matching mouth shapes (otherwise known as phonemes) with recorded audio dialog. Enhanced controls for character animation in Adobe Character Animator. Character Animator also includes new ways to customize character triggers via your keyboard or other controller, as well as better pupil and eyeball controls. Adobe Audition is a comprehensive audio production and post-production tool that is useful for all kinds of dialog, sound effects and music applications. Not only can it do things like process and edit audio, but also record it. You can even record a whole multi-track musical session as you would with a DAW, only there is no MIDI. The new version of Adobe Audition includes HUI support for control surfaces. New features to Audition include auto-ducking which automatically lowers the output level of music when other audio, such as dialog, is present. There is also auto scrolling during playback and continuous playback even while editing the waveform. While other companies try to offer alternatives to the sprawling interconnected Ecosystem of applications and Stock Footage collections known as the Creative Cloud, it is safe to say that almost every professional artist or studio seriously involved with motion graphics and video production owns a CC subscription and turns to it every day to get their work done. Adobe’s products are simply indispensable for those who communicate ideas through images and the new announcements revealed at IBC 2017 show that Adobe is committed to improving them.